Minimal preparation is required before playing your cello as it is constructed as a complete instrument. However, you must take care when handling your cello as it is made up of many parts. Always pack your cello and bow away in its case when not in use. Always take your bow out of the case first, and then your cello. Carefully take your cello out of the case and have a chair ready to sit down on. Tune your cello using the 4 tuning pegs. Carefully loosen one tuning peg at a time, wind and unwind the string to correct the pitch, then push the tuning peg back. 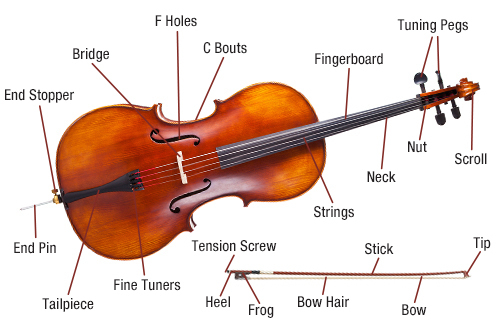 Use the fine tuners to complete the tuning process, and then your violin is ready to play! When you are finished playing, loosen the hair on the bow before putting it back in the case. And if you have a soft case, be sure to put your cello in first, then the bow. Rosin is very important for all string players. Many new cello bows will not make a sound without rosin. Rosin provides friction to the bow hairs, so that when you pull the bow across the strings, it makes a sound. After playing the cello, gently wipe it down with a soft cloth to remove rosin build-up on the strings. Do not store your cello in extreme hot or cold locations. It is is made of wood so it can crack, warp, or the varnish could melt. Make sure you never put your cello down or in its case string side down. Always store it string side up. It’s very important to get the right size cello for your child. Cellos come in all different sizes. An adult would play a full size 4/4 cello, but children will need a smaller size to begin with. We recommend having your child measured for their cello by your teacher or the store you have rented / purchased your cello from. Please see our video and tutorial links below for detailed clips on how to hold your bow and your cello. The sound of the cello is rich and deep. The instrument originated in the 16th century. Cellos are tuned in 5th’s. There are four strings A, D, G and C. The cello’s unique sound has made it a popular choice for composers over the last few centuries. Cellos are commonly seen in symphony orchestras as part of a larger section. Concertos from Hayden to Elgar, and great symphonic works by Richard Strauss and Tchaikovsky all feature the majestic and soulful sound of the cello.